Intervals of clouds and sunshine. High 82F. Winds ESE at 5 to 10 mph..
A few clouds from time to time. Low 74F. Winds ENE at 5 to 10 mph. WASHINGTON — FCC Chairman Ajit Pai has proposed directing $954 million to restore and expand communications networks in the U.S. Virgin Islands and Puerto Rico that were heavily damaged during the 2017 hurricane season. Wireless and broadband communications networks in the two territories were devastated after hurricanes Maria and Irma swept through the region in September. As of Monday, the Federal Communications Commission said 14 percent of cell sites in the U.S. Virgin Islands and 4.3 percent of the sites in Puerto Rico remained out of service. Pai is scheduled to visit the territory today and Saturday, and has a press conference scheduled for 12:15 p.m. today at Government House in Christiansted. 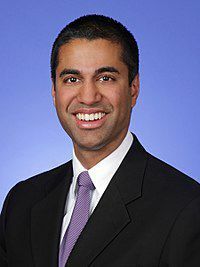 Pai wants to spend $64 million on short-term restoration, $631 million on long-term funding for the restoration and expansion of fixed broadband, and $259 million on medium-term funding for the restoration and expansion of 4G LTE mobile broadband connectivity. The plan needs FCC approval and would be funded largely by the Universal Service Fund, which provides federal subsidies to companies to make communications services more accessible and affordable in places where the cost is high. In October, the FCC approved $77 million to fund repairs in the islands. FCC Commissioner Jessica Rosenworcel, a Democrat, also is visiting Puerto Rico this week.